Discovering a more exciting idea. Almost any subject can become a more exciting idea. Too often aspiring artists settle for the first idea that comes to mind. Or whatever is shown in their photograph. The real trick to becoming an artist is learning how to effectively discover ideas that are more exciting, more dynamic. 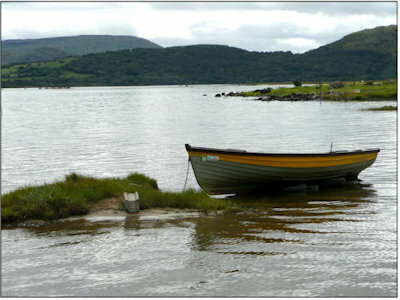 The last few weeks I've used this photograph of an Irish lough as the starting point of a search. A search that is a crucial step in the process for creating dynamic art. Looking for an idea that's more exciting than the photograph. In this search an artist must remember that nothing about their photograph is sacred. Anything in it can be changed or eliminated. Anything can be added to it in a search for a more exciting idea. And as part of that search I should also add you aren't confined to using any of the elements in your photograph. Your imagination could use a scene as merely the inspiration for something much different. I'll show you more about this in a moment. The ideas I showed you in past blog posts (like the one here) were purposely kept fairly simple and retained many of the elements of the original photograph. I purposely kept them simple to show you that changing a photograph to discover a more exciting idea doesn't have to be difficult or complicated. I purposely only added things that obviously fit with many of the elements already in the photograph. Again, to keep things simple. You want to allow your imagination to roam as far as it can. That is what subscriber Sal Barajas did. 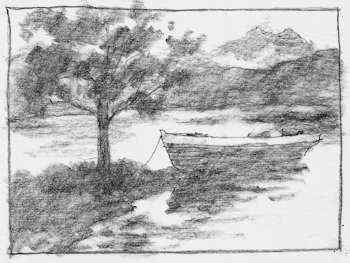 His imagination used my boat photograph merely as inspiration. Notice also that Sal uses a little different process than I do in his search for a strong idea. He begins with rough line drawings rather than the tonal sketches that I use. You can see that as he becomes more interested in a particular design the sketch gets more complete. But Sal doesn't stop there. He's established a step-by-step process that he's found works successfully for him. 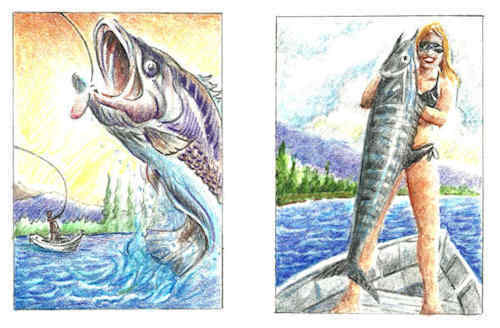 After the line sketches he does little colored pencil sketches to establish the color scheme he wants to use in the final art. In this way he finds the idea that most excites him. He creates a good design of that idea. And he decides on the general color scheme before he ever picks up a brush. The big lesson in this whole series of blog posts is this. When you adopt and use a step-by-step process every time you do art, you increase the odds of the art being successful. When you use this process to make the important decisions at the start of a project you decrease the odds of running into trouble later. Both of which increase the fun factor, because you've found your most exciting idea. P.S. Think about that for a moment. So much of successful art is based on Confidence that you can produce it. And Confidence comes from growing as an artist. Pushing yourself beyond what you've already done. Seeing and letting go of the behaviors that stymie that growth. And finding the process that consistently creates the most success for you.